Mount Rouse shire (1864-1994) was in western Victoria between Hamilton and Mortlake. Mount Rouse is a volcanic cone (367m) in the south of the former shire. It was named by the New South Wales Surveyor-General, Thomas Mitchell, when returning from his Australia Felix expedition in 1836. He probably named it after Richard Rouse, a pastoralist of Parramatta, New South Wales. Before the formation of the shire (or the preceding road district of 1860) Mount Rouse was an Aboriginal Protectorate during 1840-46. It reverted to pastoralism after removal of the protectorate. The creation of the road district came a few years after the surveying of Dunkeld in the north of the shire and Penshurst in the south. 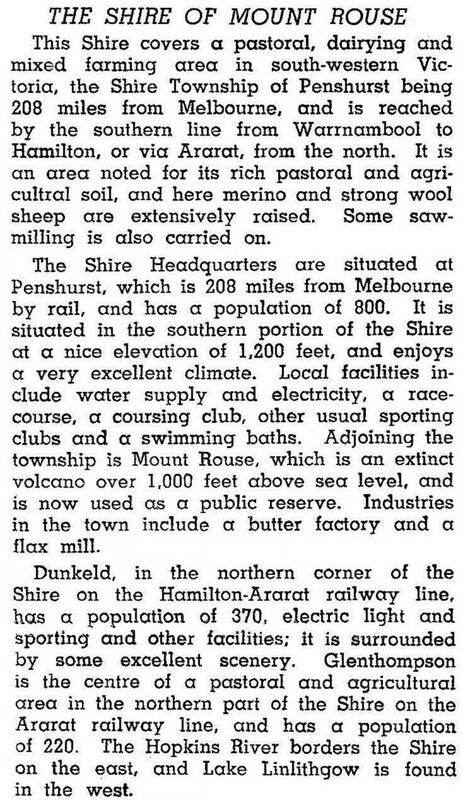 The shire was proclaimed on 26 January 1864, and Penshurst was its administrative centre. Penshurst is 2 km from the cone-like Mount Rouse and on the Hamilton Highway. The railway line from Hamilton to Penshurst and southwards to Koroit operated during 1890-1977. The line from Hamilton to Dunkeld and Glenthompson in the north of the shire (1877) continued to run. There was also a short-lived line between Penshurst and Dunkeld (1890-98). Much of the shire has a background of Scottish pastoral settlement, and Presbyterian churches were often the first to be built. In the west, however, there is a proximity to Lutheran settlements which centred on Hamilton. The Bethlehem Lutheran church at Tabor continued with a strong congregation. Its Lutheran school ran from 1862 until 1990. Settlement by another Lutheran group goes back to the utopian Herrnhut settlement in 1852. The Mount Rouse shire contained several notable homesteads: the earliest, Chatsworth House (1859) was near the shire’s eastern boundary, the Hopkins River; the Kolor homestead and woolshed, perhaps the most spectacular, are a little south of Penshurst; and Devon Park (1883) is south of Dunkeld. Evidence of Aboriginal occupation is strikingly evident from the grinding grooves in sandstone at Nareeb south of Glenthompson. All these, along with the former shire offices, are on the Register of the National Estate. In 1994 farming occupied 84% of the former shire’s area of 1407 sq km. There were 656,000 sheep and lambs and 26,300 meat cattle. Wheat and barley (1542 and 618 tonnes) were harvested.